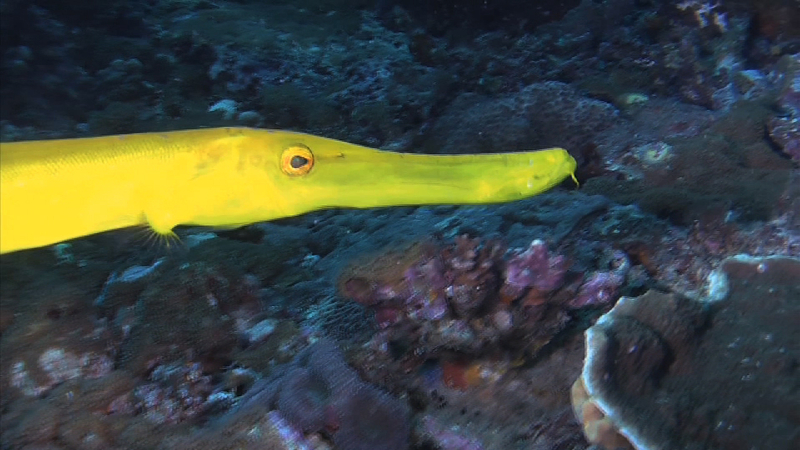 This is a Painted Flutemouth fish, also known as a Trumpet Fish. It’s usually 15 to 31 inches long, including that long snout. This fish is sneaky. It sometimes swims in an upright position to look like a coral branch or floating twig. This lets it ambush smaller fish it wants to eat. I think we can all agree – that’s one weird animal! Este es el pez flauta, también conocido como pez trompeta. Por lo general mide de 38 a 78 cms de largo, incluyendo su largo hocico. Este pez es astuto. A veces nada en una posición vertical para parecerse a una rama de coral o a una ramita flotante. Esto le permite emboscar a los peces más pequeños que quiere comer.